Chapter 24 Acquires Witness Tree Vineyard Partners Mark Tarlov, formerly of Evening Land, and Burgundy’s Louis-Michel Liger-Belair, have bought the 100-acre Witness Tree Vineyard in the Eola-Amity Hills. Also, they acquired the 13-acre Black Walnut Vineyard in the Dundee Hills. Chapter 24 is planting another 30 acres at Witness Tree and will transfer all wine production to the Witness Tree property in time for the 2017 vintage. WillaKenzie Estate Hires Eric Kramer as Director of Winemaking Founded in 1992, WillaKenzie Estate produces Pinot Noir and Pinot Gris from estate and purchased grapes. The winery was named after the sedimentary soil on which the estate vineyards are planted. WillaKenzie Estate was acquired by Jackson Family Wines last year. Kramer has been crafting wine in the Willamette Valley for 13 years, most recently at Domaine Serene. Longtime assistant winemaker Michael Caputo and enologist David Mass remain a part of the WillaKenzie winemaking team. Sonoma County Barrel Auction Hosted by Sonoma County Vintners, this invite and trade-only event will take place on April 21, 2017. The Barrel Auction offers one-of-a-kind never-before and never-again lots representing Sonoma County’s diverse viticultural appellations. The wines for the Barrel Auction are chosen by an all-star panel of Master Sommeliers from around the country who assess the wines to ensure the highest quality, terroir authenticity and varietal correctness. The 2017 Barrel Auction is on pace to exceed last year’s offering of 75 small-lot wines. The selected auction lots will be previewed at Sonoma County AVA Association events on April 20, and auctioned the following day to select licensed wine sellers, including retailers, restaurateurs and wholesalers, invited personally by participating wineries. For further information, visit www.sonomacountyvintners.com. French Concerned About Drinking During Pregnancy Like in the U.S., wineries in France are required to print a health warning for pregnant women on the back of their wine bottles. The French Ministry of Health recently decreed that the pictograph show a pregnant women drinking from a glass inside a no symbol be increased in size to be more visible. About 1 in 1,000 infants are born with fetal alcohol syndrome in France. Drinking Socially is Good for Your Health. Recent research has shown something that will wine drinkers already know. Drinking wine in moderation with friends has undeniable health benefits. A study published in the journal, Adaptive Human Behavior and Physiology, looked at the benefits of alcohol consumption at pubs in strengthening social cohesion. The researchers pointed out that alcohol triggers the endorphin system, promoting social bonding, which in turn can affect how satisfied people are with their life. 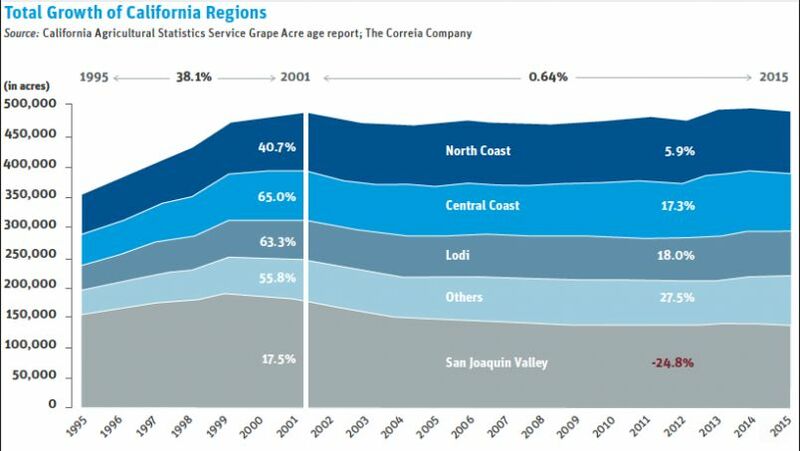 Winery & Vineyard Sell-off to Continue Elin McCoy wrote an article in BloombergPursuits, https://www.bloomberg.com/news/articles/2017-01-18/half-of-u-s-wineries-might-be-sold-in-the-next-five-years, with the heading, “Half of U.S. Wineries Might be Sold in the Next Five Years.” She points out that last year in California and Oregon, more than 35 “high-profile” wineries and vineyards were sold. 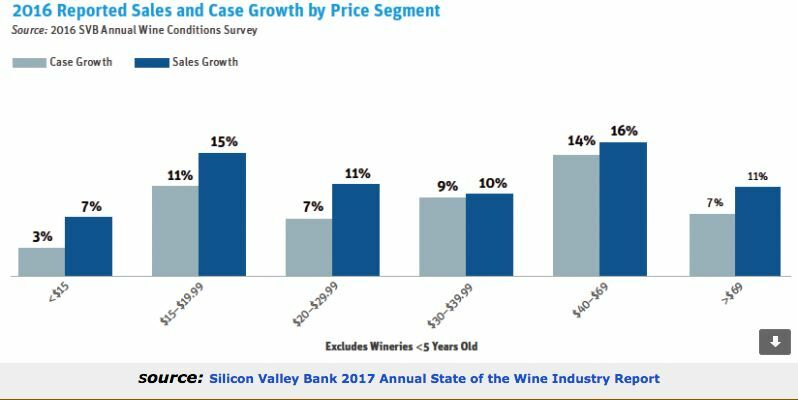 Silicon Valley Bank’s State of the Wine Industry 2017 predicts continued sale of vineyard land this coming year. 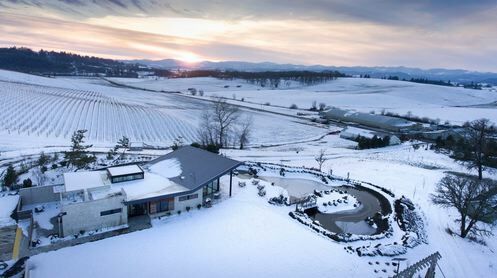 The report says that in a survey of U.S. winery owners, 30 percent were considering or expecting a sale during the next five years and an additional 20 percent said a sale during that time frame was possible. There are several reasons for this trend. Baby boomers are becoming older and want to retire and their offspring do not have interest in taking over the business. Buyers want prime land in areas where there are few plant able acres. Small brands have difficulty getting their wines in the retail marketplace and look to acquisition by bigger wine companies that have marketing and distribution muscle. Oregon is of prime interest now because top vineyards there cost one-tenth the price in Napa Valley. What impact this will have on the quality of the wines from wineries that have been acquired remains to be seen but it is worrisome that profit may be put ahead of character, individuality and pure genius that wines from small producers have to offer. Genetically Engineered Yeast Could Increase Wine Quality Researchers working at the University of Illinois College of Agricultural, Consumer and Environmental Services (ACES) claim to have produced a yeast that potentially could increase the quality of wine and also reduce wine’s hangover-inducing properties. Using a technique they called a “genome knife,” researchers could perform precise metabolic engineering on the yeast, Saccharomyces cerevisiae, commonly used in winemaking. It is conceivable, that with engineered yeast, the amount of resveratrol in a variety of wine could be increased by ten times or more, and malolactic fermentation could be improved while removing the toxic by-products that case hangovers. The research was recently published in the journal Applied and Environmental Microbiology. Vector for Red Blotch Found Last year, California researchers had a major breakthrough in the potential management of Red Blotch Associated Virus (RBaV). At least one vector, the three-cornered alfalfa treehopper, is now known for the disease but very little is understood about the feeding habits and biology of this pest. Greenhouse tests showed that the treehopper could transmit RBaV. Studies are continuing of other insect vector candidates as well. 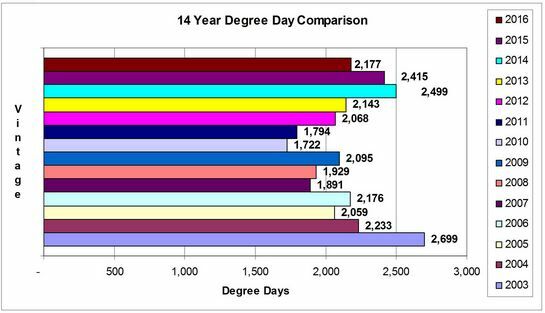 14 year Degree Day Comparison Amalie Robert Estate in Willamette Valley This chart shows the comparative degree days recorded at the Amalie Robert Estate from 2003 to 2016 (thanks to owner Ernie Pink), and is a good indicator of the relative weather temperatures during the grape growing season. The findings should be generally comparable for other areas of the Willamette Valley. 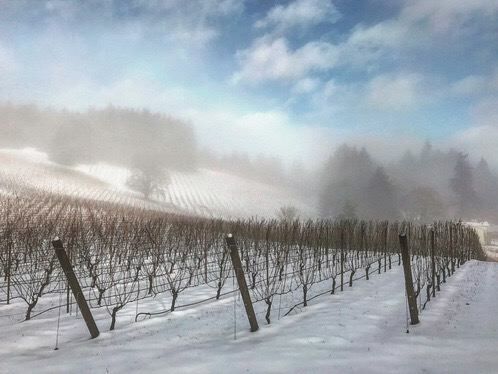 Oregon’s Vineyards Covered in Snow this Winter There is something eerily beautiful about vineyards with dormant vines covered in snow during winter. Oregon had more snow than usual the past several weeks and this made for spectacular photography. The photos below come from Saffron Fields Vineyard in the Yamhill-Carlton AVA (above, courtesy of Andrea Johnson) and the Luminous Vineyard also in the Yamhill-Carlton AVA. Steve Doerner’s Family Label Veteran winemaker Steve Doerner of Cristom Vineyards has released the second vintage of Pinot Noir under the Lucas Jefferson label. More details and a review of the wine will be upcoming in the next issue of the PinotFile. Record DTC Wine Shipments in 2016 A new report from Sovos ShipCompliant and Wines & Vines indicates that wineries sold more than 5 million cases (worth more than $2 billion) through direct shipments in 2016, a record increase in direct-to-consumer (DTC) shipments compared to 2015. Wine shipments outpaced retail sales growth by more than three-to-one in 2016. The increase reflects the popularity of wine ordering online and increased participation in wine clubs. 45 states and the District of Columbia allow direct wine sales. California is the leader in DTC orders, with nearly a third of all direct shipping orders.Shipments of wine priced under $15 per bottle grew faster than any other segment. Rosé Today Rosé Wine Today is holding two events: 2017 Competition for dry, a little sweet and sparkling rosés at Soda Rock Winery in Healdsburg March 22, 2017, and A Country Garden Party where the award-winning rosés from Rosé Today 2017 Competition will be celebrated on June 17, 2017, at Jaxon Keys Winery in Hopland. For information, visit www.rosewinetoday.com. Wine Stimulates Appetite Do you notice that when you drink a glass of wine before dinner your hunger increases? Research published in Nature Communications examined how alcohol affects the body, brain and actions of mice. The alcohol stimulated certain neurons, called AgRP, found in the hypothalamus, that increased appetite and decreased metabolism and energy levels. The researchers believe a similar reaction occurs in humans. New Wine Center for La Crema La Crema Estate at Saralee’s Vineyard in Windsor is a site to behold. The botanical wonders were planted by former owner Richard Knude who loved Butchart Gardens in British Columbia where he proposed to his spouse, Saralee. 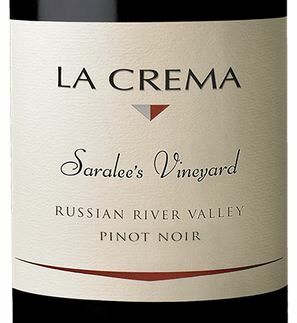 La Crema’s new tasting facility opened at Saralee’s Vineyard in August 2016. La Crema is part of Jackson Family Wines and bought the 200-acre estate from the Kundes in 2012. The main tasting room is in the Knude’s former house that was a restored barn first built in 1900. The tasting facility houses an impressive art collection that changes periodically. There are multiple tasting venues including an area on the second level with a tasting bar and seating, and in the back a main tasting bar and deck. Downstairs is a cellar where the winery’s limited production wines can be tasted by appointment. The third level is a wine club lounge. VIP tasting experiences are offered including Saralee’s Tasting Vineyard Tour, giving a personal look at the different grape varieties grown on the property, the botanical gardens and two lakes. The estate also has a pavilion, Richard’s Grove, for wine education seminars and community events. The estate will host the 2017 Sonoma Harvest Wine Auction in September. Visit www.lacrema.com/ russian-river-estate/. Oregon the Value-Priced Pinot King? Wine Spectator’s latest issue reports that 698 Pinot Noirs were tasted in 2016 by the magazine. Of these, only four value-priced PInot Noirs (priced at $30 or less) scored 90 or above. For Oregon, 838 wines were tasted (the number of Pinot Noirs was not broken out), 26 value-priced wines (priced $30 or less) scored 90 or above. Make what you want out of this, but I find very few Pinot Noirs from either state that are worthy of a score of 90 or above when priced $30 or under. If you know of any, I would be curious to learn about them. Winter Allocation Anxiety Over Pinot (WAAOP) WAAOP is a recently diagnosed psychiatric condition common among pinotphiles that is unresponsive to any treatment other than complete abstinence from winery mailing lists. It is brought on by the confluence of multiple notable domestic Pinot Noir producers announcing to their mailing list within days of each other the limited availability of upcoming fall releases. Anxiety in the sufferer begins a few days into the New Year and stretches over the month of January as the afflicted attempt to decide which allocations are really important. The onset is often at a time when wine lovers have just recovered from the wallet-busting days of Christmas and credit card statements are arriving in the mail. Wineries exacerbate the condition by warnings of impending catastrophe if you miss out by not acting quickly to insure your allocation. Worse yet, the winery may make it simple by allowing you to check the box that commits you to your entire allocation. The sufferer may be traumatized by the threat that if they fail to buy their allotment, their allocation may diminish or even worse, disappear. Those afflicted often retreat into their cellar, staring at racks of wine, trying to decide whether they really need more wine. Worse yet, they may question the need for their impending purchases with their spouse who, God forbid, may not share the same enthusiasm for Pinot Noir. Some have found comfort in Wine Clubs since they deliver wine regularly without the need to agonize over purchasing decisions. As a pimp of Pinot, I feel as if I have contributed to the prevalence of WAAOP, so I offer my wry condolences. More Humor A woman was married several times to men in the wine industry. Yet she remained a virgin. How could that be? Here was her explanation. My first husband was a winemaker and he kept promising me how good it was going to be if we waited a few more years. My second husband was a wine critic and just wanted to talk about it. My third husband was a professional wine taster and all he wanted to do was, well, you know. My fourth husband was a wine collector and he just wanted to look at it. My fifth husband was a wine marketer and although he had a nice product, he never knew how to position it. My sixth and last husband was a grape grower and he just wanted to stomp on me. (From Vintage Humor for Wine Lovers by Malcolm Kushner).